The British Library (BL) is the national library of the United Kingdom. It is based in London and Boston Spa and is one of the world's most significant research libraries, holding over 150 million items. The library's collections include around 25 million books, along with substantial additional collection of manuscripts and historical items dating back as far as 300 B.C.E. As of 2004, the library held 11.2 million monographs and received more than 41,500 regular serials. As a legal deposit library, the British Library receives copies of nearly all books produced in the United Kingdom, including all foreign books distributed in the UK. It also purchases many items which are printed abroad. The library adds some three million items every year. In the past, the British Library restricted use of its reading room to people who needed access to deep and specialized collections which they could not find anywhere else. By the end of the twentieth century, however, partly through technological advances allowing users to search and study material through the internet, and partly due to its expanded facilities, the library adopted a more welcoming approach. It now has a six-part mission to serve the public: enriching the user's experience, building the digital research environment, improving searches, enlarging the British national collection, library staff development, and financial sustainability. Through this effort, the British Library both preserves documents of historical significance to humankind and provides access to a wealth of information that can educate and enhance the understanding of all people with regard to the totality of human recorded knowledge, thus contributing substantially to a better world. 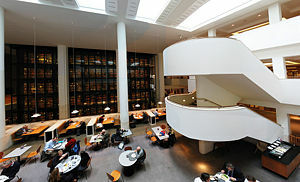 As an institution, the British Library is young compared with equivalent institutions in other countries, having been created in 1973 by the British Library Act 1972. Prior to this, the national library was part of the British Museum, which provided the bulk of the holdings of the new library, alongside various smaller organizations which were folded in (such as the British National Bibliography). As part of the British Museum, the library was founded in 1753. The two were based on the collections of Sir Hans Sloane; Edward and Robert Harley, earls of Oxford; and Sir Robert Cotton. The addition of the royal libraries of Kings George II and III further enlarged the library, leading to its being the largest in the world. The core of the library's historical collections are based on this series of donations and acquisitions from the eighteenth century, known as the "foundation collections." During World War II, a large number of books and newspapers were destroyed by the bombing of London by Nazi Germany. One of the famous facilities within the museum was the massive, round, domed reading room. It was designed by the man sometimes called the "second founder" of the British Museum, the Italian librarian Antonio Panizzi and architect Sydney Smirke. The reading room was completed in 1857. Many great writers including Charles Dickens, Karl Marx, and Virginia Woolf are known to have used it. The library split off of the British Museum in 1972. For many years its collections were dispersed in various buildings around central London, in places such as Bloomsbury (right next to the British Museum), Chancery Lane, and Holborn, with the lending library at Boston Spa, Yorkshire and the newspaper library at Colindale, northwest London. However, since 1997, the main collection has been housed in a single new building on Euston Road next to St. Pancras railway station. The new library was designed specially for the purpose by the architect Colin St. John Wilson. Facing Euston Road is a large piazza that includes pieces of public art by Eduardo Paolozzi (a bronze statue based on William Blake's study of Isaac Newton) and Anthony Gormley. It is the largest public building constructed in the United Kingdom in the twentieth century. At the heart of the building is a four-story glass tower containing The King's Library, with 65,000 printed volumes along with other pamphlets, manuscripts and maps collected by King George III between 1763 and 1820. The tower's design was inspired by Yale University's Beinecke Library. Post-1800 newspapers are still held at Colindale, North London, and the Document Supply Collection is held at the Boston Spa site in Yorkshire. The Library also has a book store in Woolwich. In 1983, the library absorbed the National Sound Archive. 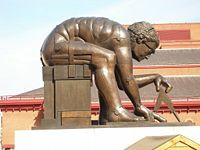 In May 2005, the British Library was awarded £1 million by the London Development Agency to transform two of its reading rooms into the Business and Intellectual Property Centre. The Centre was opened as a permanent resource in March 2006, and holds the most comprehensive collection of business and intellectual property in the United Kingdom. It is the official library of the UK Patent Office. The collection is divided up into four main information areas: market research; company information; trade directories; and journals. It is available for free in hard copy and online via approximately 30 subscription databases. A reader pass is required to access the collection and the databases. There are over 50 million patent specifications from 40 countries in a collection dating back to 1855. The collection also includes official gazettes on patents, trade marks, and registered designs; law reports and other material on litigation; and information on copyright. This is available in hard copy and via online databases. A reader pass is required to access the collection and the databases. • The provision of a networking area for Small- or Medium-sized Business (SMB) or SME (Small and medium enterprise) owners to meet and network, find out about the library's full range of services, and receive inspiration from success stories about products and services conceived by other center users. • Workshops and clinics run by the British Library and its business partners on subjects including: using intellectual property resources to check if ideas are novel, how to protect ideas and designs, capitalizing on market research resources, financing, marketing and selling skills, and pinpointing customers. Some of these workshops have a specific focus on supporting the needs of women, black and Asian minority ethnic groups, and entrepreneurs with disabilities. These are free or charged at a subsidized rate. The library's collection is around 25 million volumes. In the British Library's digital library project collections can be toured online and the virtual pages of Leonardo da Vinci's notebooks and other great works can be turned electronically. The library's secure electronic delivery service, started in 2003 at a cost of six million pounds, brings access to more than one hundred million items (including 280,000 journal titles, 50 million patents, five million reports, 476,000 U.S. dissertations and 433,000 conference proceedings) for researchers and library patrons worldwide which were previously unavailable outside the library due to copyright restrictions. The use of the library's web catalog also continues to increase. In 2003 more than 9.7 million searches were conducted. Unlike the Library of Congress, the British Library does not specifically serve the legislature. Parliament has its own libraries, the House of Commons Library and the House of Lords Library. The Library of Congress is larger in terms of miles of shelves, as its collection fills about 530 miles (850 kilometers), while the British Library reports about 388 miles (625 kilometers) of shelves. However, the British Library has more items, with approximately 150 million items including 25 million books, whereas the Library of Congress has about 130 million items with 29 million books. The British Library also holds the Oriental and India Office Collections (OIOC), now called APAC (Asia, Pacific & Africa Collections) which contain the collections of the India Office Library and Records, and materials in the languages of Asia and of north and north-east Africa. The entrance gate and its own shadow. The gate was designed by Lida and David Kindersley. An Act of Parliament in 1911 established the principle of the legal deposit, ensuring that the British Library, along with five other libraries in Great Britain and Ireland, is entitled to receive a free copy of every item published in the United Kingdom and the Republic of Ireland. The other five libraries are: the Bodleian Library at Oxford; the University Library at Cambridge; Trinity College Library in Dublin; and the National Libraries of Scotland and Wales. The British Library is the only one that must receive a copy of every item published in Britain; the others are entitled to these items but must specifically request them from the publisher. The Legal Deposit Libraries Act 2003 extended the legal deposit requirements to electronic documents such as CD-ROMs and selected websites. The library explains its policies on legal deposit here. The British Library Newspapers section is based in Colindale in North London. The library has a more or less complete collection of British and Irish newspapers since 1840, owing in part to legal deposit legislation of 1869 mandating that the library receive a copy of each edition of a newspaper. London editions of national daily and Sunday newspapers are complete back to 1801. In total the collection consists of 660,000 bound volumes and 370,000 reels of microfilm containing tens of millions of newspapers with 52,000 titles on 45 kilometers of shelves. A collection of particular interest is the Thomason Tracts, containing 7,200 seventeenth-century newspapers, and the Burney Collection featuring newspapers from the late eighteenth and early nineteenth centuries. The Thomason Tracts and Burney collections are held at St. Pancras, and are available in facsimile. The section also has extensive records of non-British newspapers in languages that use the Latin and Cyrillic alphabets. The collection is less substantial for languages of the Middle East and the rest of Asia, though some holdings of these are held at the main library in St. Pancras. The British Library Philatelic Collections are the National Philatelic Collections of the United Kingdom. The collections were established in 1891 with the donation of the Tapling Collection, they steadily developed and now comprise over twenty five major collections and a number of smaller ones, encompassing a wide-range of disciplines. The collections include postage and revenue stamps, postal stationery, essays, proofs, covers and entries, specimen issues, airmails, some postal history materials, and official and private posts for almost all countries and periods. An extensive display of material from the collections is on exhibit and is probably the best permanent display of diverse classic stamps and philatelic material in the world. Approximately 80,000 items on six thousand sheets may be viewed in one thousand display frames; 2,400 sheets are from the Tapling Collection. All other material, which covers the whole world, is available to students and researchers by appointment. As well as these extensive collections, the subject literature is very actively acquired, and makes the British Library one of the world's prime philatelic research centers. The Chinese Diamond Sutra, the oldest known dated printed book in the world, printed in the ninth year of Xiantong Era of the Tang Dynasty, 868 C.E. The Stein collection from Central Asia. The British Library's Stein collection of Chinese, Tibetan, and Tangut manuscripts, Prakrit wooden tablets, and documents in Khotanese, Uyghur, Sogdian and Eastern Turkic is the result of his travels through central Asia during the 1920s and 1930s. Stein discovered manuscripts in the previously lost Tocharian languages of the Tarim Basin, and recorded numerous archaeological sites especially in Iran and Balochistan. 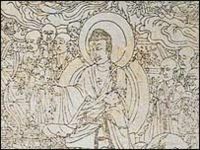 Stein's greatest discovery was made at the Caves of the Thousand Buddhas, near Dunhuang (Tun Huang). It was there that he discovered the Diamond Sutra, the world's oldest dated printed text. The Codex Arundel, one of Leonardo da Vinci's notebooks. Working manuscripts by Johann Sebastian Bach, Wolfgang Amadeus Mozart, Gustav Mahler and Benjamin Britten. A number of important works are on display to the general public in a gallery called "Sir John Ritblat Gallery: Treasures of the British Library" which is open to the public seven days a week at no charge. The library also stages temporary exhibitions on a wide range of subjects, not just literature. Recent exhibitions include Elizabeth Barrett Browning and Benjamin Franklin (2006). Other items can be accessed in the reading rooms. In the past the library emphasized its role as a "library of last resort" for people who needed access to deep and specialized collections which they could not find anywhere else. Nowadays it adopts a more welcoming approach and emphasizes on its website that anyone who wishes to carry out research can register for a reader's pass, providing they furnish the necessary identification for security purposes. The library has come under criticism for admitting undergraduate students (who have access to their own university libraries) to the reading rooms, but the library states that they have always admitted undergraduates as long as they have a legitimate personal, work-related, or academic research purpose. Catalog entries can be found on the British Library Integrated Catalogue, which is based on Aleph, a commercial Integrated Library System. 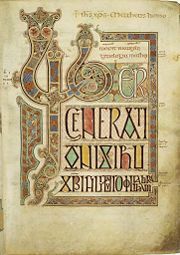 Western Manuscripts are indexed and described on MOLCAT and the Digital Catalogue of Illuminated Manuscripts. The Library's website also offers other specialized catalogs and research services. According to the website, more than half a million people use the library's reading rooms every year. The large reading rooms cover hundreds of seats which are often filled with researchers every day, especially during the Easter and Summer vacations. The library exists to serve researchers, business people, schools, and the general public. It supports research endeavors through an extensive online catalog, imaging services, research consulting, public exhibitions, and providing a public space in which to conduct research. The library accomplishes these goals through its 150 million item collection. The library has a six part mission to serve the public. This mission includes enriching the user's experience, building the digital research environment, improving searches, enlarging the British national collection, library staff development, and financial sustainability. The British Library is transforming as research and media transform, and has the stated goal of not falling behind the digital divide by not taking advantage of new technologies such as the internet and increases in computing power. ↑ King George III: History of the Monarchy. Kings and Queens of the United Kingdom. Retrieved June 7, 2007. ↑ Guided Tours. Secret London Walks and Visits. Retrieved March 29, 2007. ↑ Encyclopædia Britannica: British Library. Retrieved April 25, 2007. ↑ Welcome Message from the Librarian of Congress. Retrieved April 25, 2007. ↑ The British Library: About us: Did you know? Retrieved April 25, 2007. ↑ Welcome Message from the Librarian of Congress Retrieved April 25, 2007. ↑ A. N. Wilson, Evening Standard; Tristram Hunt, Guardian. ↑ Overview of the Library. British Library. Retrieved April 1, 2007. ↑ The British Library's Strategy. British Library. Retrieved April 1, 2007. ↑ Redefining a great library in the 21st century. British Library. Retrieved April 1, 2007. Philatelic collections. Retrieved April 4, 2005. Sussex, John (ed.) (1990). Stamp World London 90, souvenir handbook. Stamp World Exhibitions. ISBN 0951589105. This page was last modified on 25 June 2016, at 18:29.